It seems that every other day since we arrived in Michigan it has rained, and every other day it has been sunny. Sunday was not only sunny, but a warm. I spent the morning working on straightening out the damage I had done to the tool box mounted on the front of my trailer when I "pinched" it backing into the parking place in Ranburne, AL. With my brother-in-law's metal modeling tools I was able to pretty much straighten out the damage and make the box look somewhat normal again. After that was finished Elliott, my aforementioned brother-in-law, invited me on a bike ride. He has a 11.6 mile loop he does through the local countryside. It was a much nicer loop than the one I did a few days ago.....much less traffic! A little local knowledge makes a big difference. We pounded out the 11.6 miles at an average speed of around 15mph. 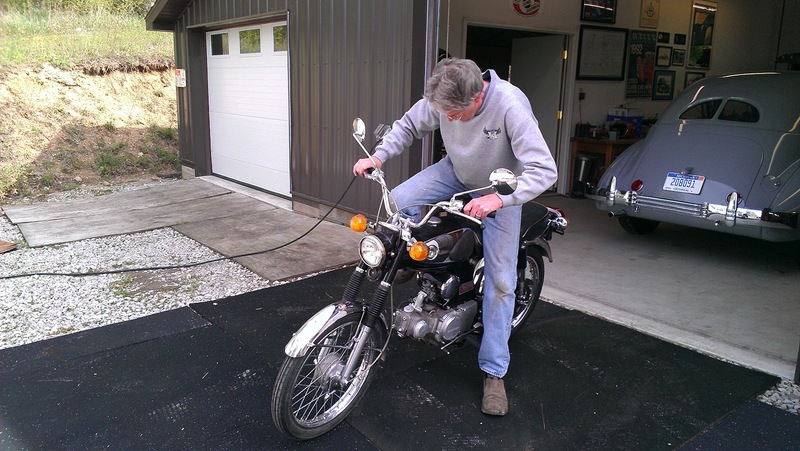 Later on in the afternoon Elliott came up to the barn and began the finishing touches on a 1968 Honda S90 he has been doing a partial 50% restoration on. When we arrived last Thursday, this bike was mostly disassembled, but Sunday was the day it would all be put back together and started. 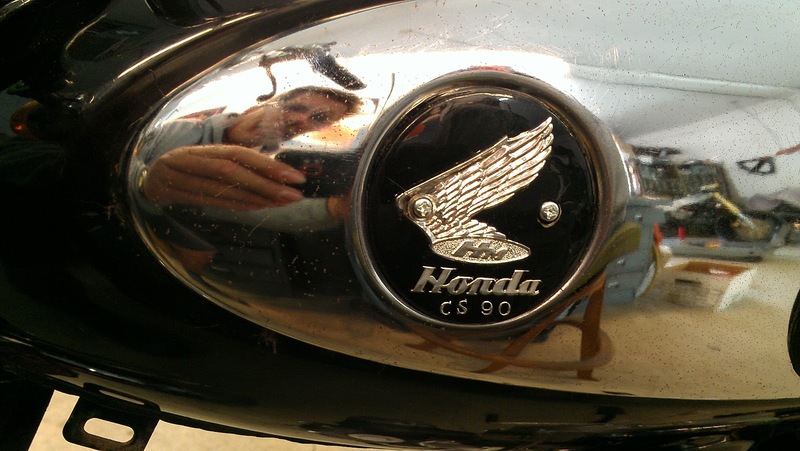 I spent a lot of time in the mid 60's riding around on a Honda identical to this one, so this was a very nostalgic afternoon for me. After a few hours it was time to take the bike outside and kick start it.....of course it started right up! After warming it up Elliott asked me the magic question I had been waiting to hear since we arrived here....."would you like to take it for a ride? "......of course I would. I quickly put on a helmet and headed down the local country road for a couple of miles....it was like I was transported back to 1965 and I felt like I was 16 again...for just a few minutes. 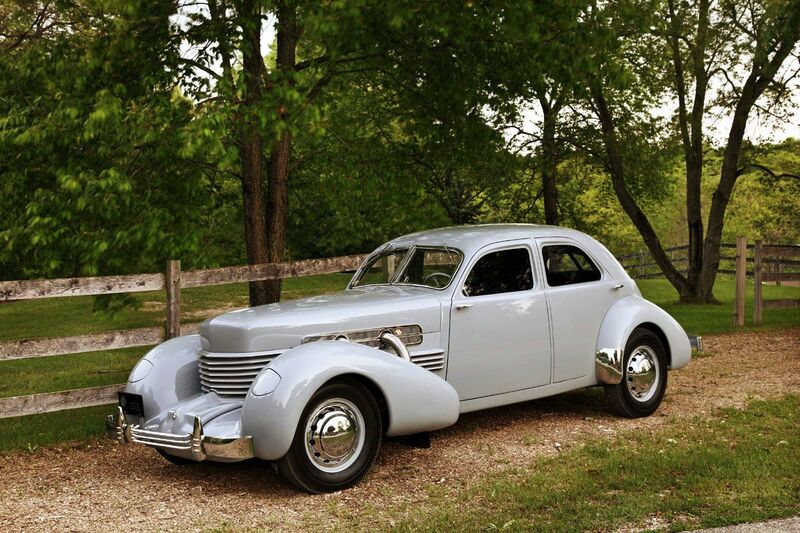 The Super 90 ran smooth as silk down the highway. 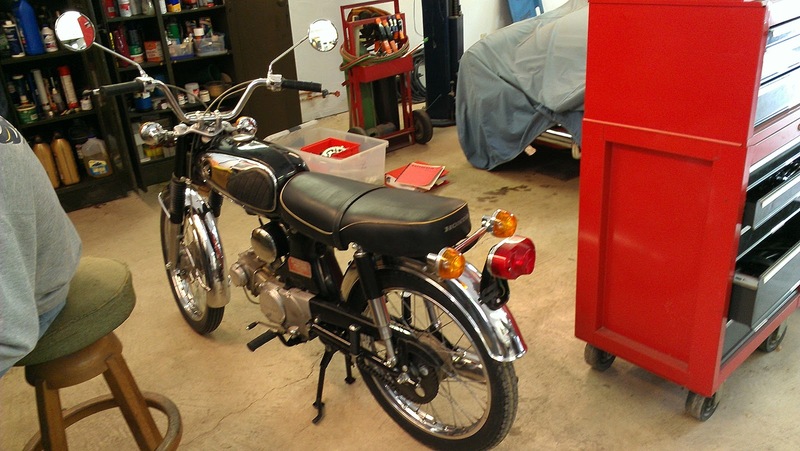 This 90cc bike was a big seller for Honda for many years in the 60's.....I think my friend's cost him around $500 in 1965. Later on that evening Elliott fired up the BBQ and grilled some salmon for dinner. 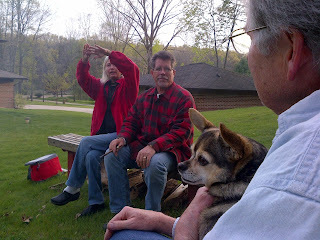 To cap off the day we had a bonfire an invited some of the neighbors over. I smoked a cigar, and sipped a little Scotch.....a nice end to a very nice sunny day! The picture below was taken at almost 8pm...it doesn't get dark until almost 9pm here. Well that was our sunny day.....no doubt tomorrow it will rain! Thanks for stopping by! It's difficult for me to wrap my mind around the fact that we, on Monday, will have been on the road for 3 months now, and have traveled close to 6,000 miles. Our view has changed often, which is one of my favorite things about this life style. We are seeing places and things that we only had seen pictures of before. My sister and her husband moved to Chelsea, MI almost a decade ago now, and this is our first visit. When Elaine was still working full time and we were taking extended motorhome trips this was just too far beyond our range. Well, now there is not much out of our range, and we have the time to wander wherever we wish. This is our third day in Chelsea, and I just cannot get enough of this beautiful countryside! Today, Friday, I took a 10 mile bike ride in a big loop around the local area and every bend in the road was a great view.....lakes, ponds, pasture land......and the temperature was barely over 50 degrees.....the heat and humidity of the Gulf Coast is distant memory now, but wow, what memories we have of that time along the Gulf! We spent part of the day in Ann Arbor in, and around the University of Michigan, whose presence dominates every corner of this urban setting. The university itself is home to over 60,000 undergraduate and post graduate students....a large town all by itself. 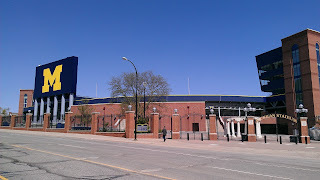 Of course, we had to walk around Michigan Stadium, aka "THE BIG HOUSE" where the U of Michigan Wolverines play football every fall. 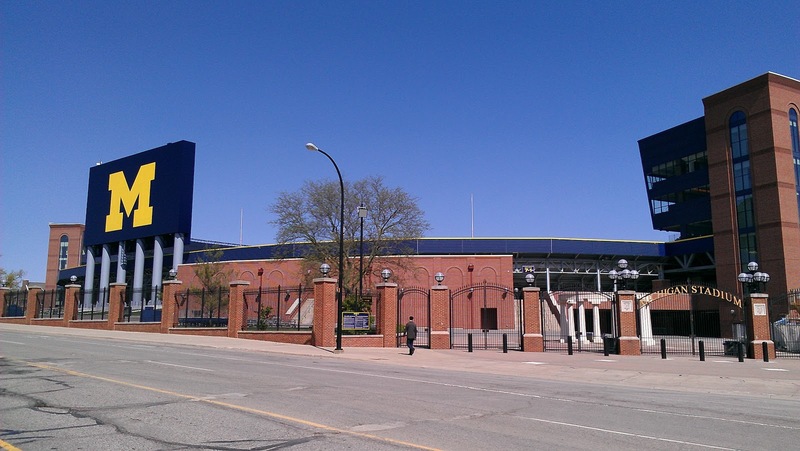 The capacity of this stadium is around 111,000. Also visited one of the coolest hardware stores (Stadium Hardware) I have ever been in.....room after room of hard to find hardware. A funky old aluminum trailer living its second life as a drive through coffee place! After lunch at a local bagel place (Barry Bagel's) we headed home. I had some work to do, and Elaine went into town with Jill to her gym for some exercise.....this is when I took my aforementioned bike ride. We shared another amazing meal prepared by my sister with she and Elliott, her husband. Elliott, by the way, has been restoring cars for as long as I have known him. 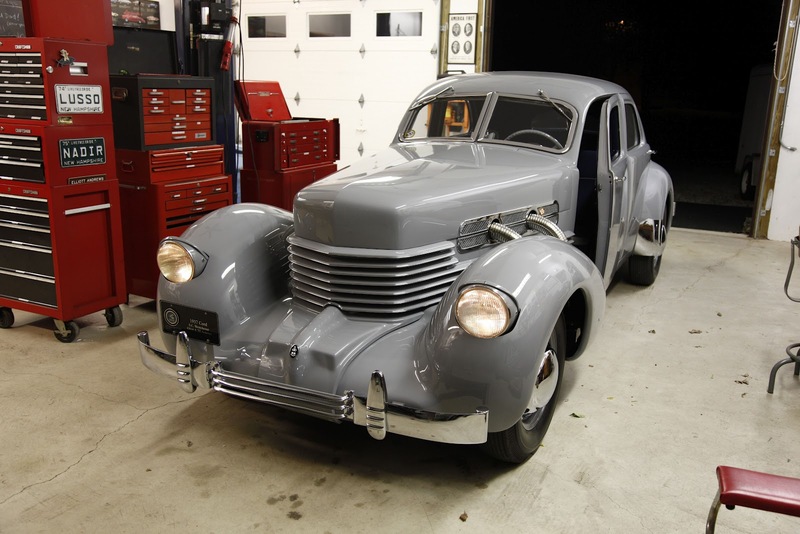 His current project, which took him 11 years to faithfully restore, is a 1937 Cord Supercharged Westchester flatback, which is currently listed on Ebay . His garage, which is the barn you can see in the picture at this top of this blog post. Who knows what adventures await us tomorrow? Tune in and find out! Thanks for stopping by! 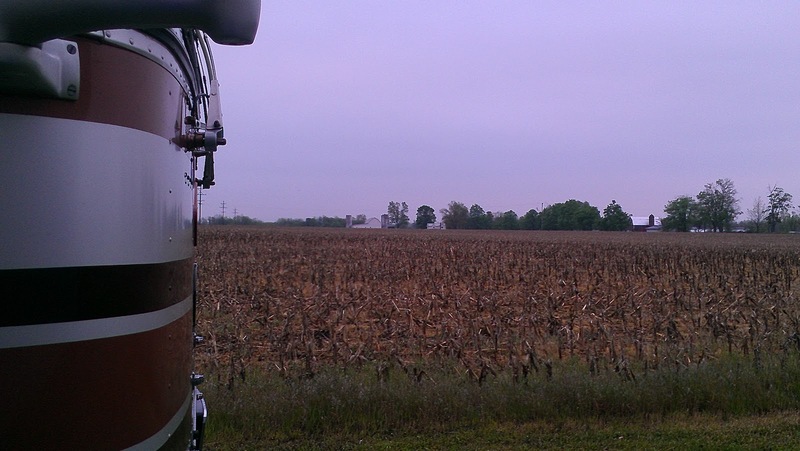 Since Tuesday we have continued our travel north on I-65 through Louisville, KY and into Indiana, and now find ourselves just over the border into Michigan as I write (I finished this post later in the day from our destination for the day....Chelsea, MI). Tuesday morning we aimed to depart Campbellsville, KY around 10am, but ended up leaving around 10:20am. 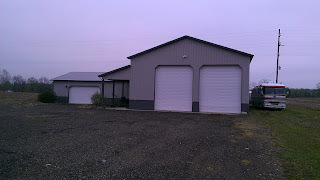 We had come in on Sunday to Heartland RV Park and were told over the phone by the owner to "just pick a spot and I'll be by in the next couple of days to settle up with you". Well he finally came by Tuesday morning as we were getting ready to leave.....I wasn't going to leave until we took care of our business with the owner, but I was beginning to wonder if he was coming. There was another RV that was in the same fix, but we paid our $20/day.....very reasonable to be sure, and were on our way. 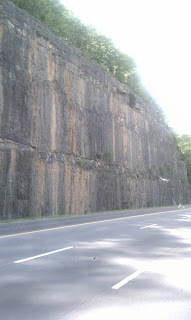 We took the 210 Bypass road out of Campbellsville, and were very pleasantly surprised with the quality of this two way highway, and found ourselves back on the interstate in no time at all. We drove northbound on I-65 to Indianapolis, IN where we fueled up at a Flying J, and then changed over to I-64 to continue north to Anderson, IN where we had found a nice Cracker Barrel to park behind this night. 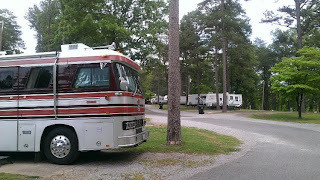 We were joined by three other motorhomes in the parking lot, including to pretty new Prevosts. The evening was uneventful, and very quiet. Our goal Wednesday was around 133 miles north just into southern Michigan at Coldwater Lake. A fellow Newell owner had contacted us through the Newell Classic website (www.newellclassic.com) and invited us to stay on their property for the evening and out to dinner. 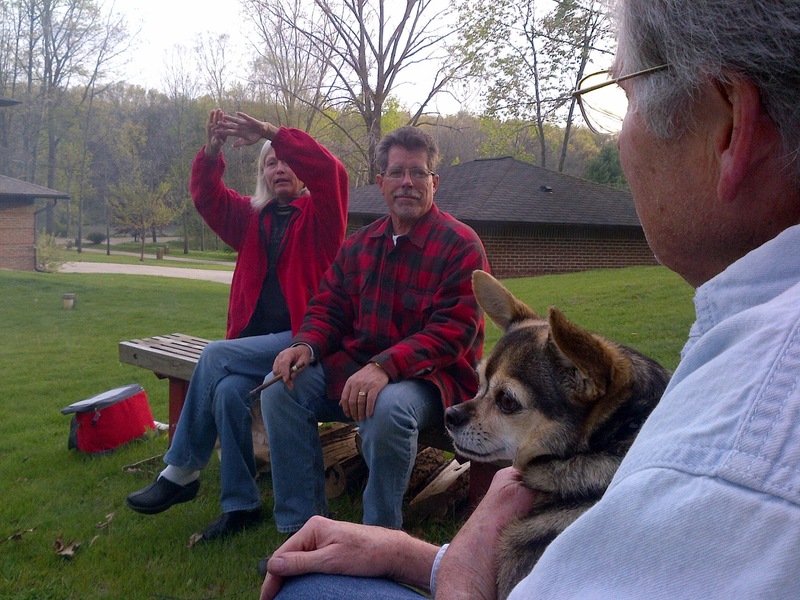 Our hosts were Larry and Vanessa Weikart. I can't say enough about Newell owners......they really roll out the red carpet, and Larry and Vanessa are no exception. They have a nice lakefront home on Iyopawa Island. 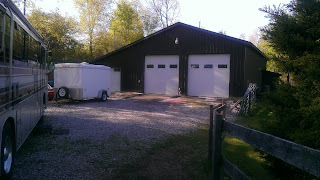 The barn pictured above is located off the island on farm land they own. We were provided with a 50amp power outlet to power our coach's systems overnight. Larry picked us up at the barn and drove us over to their home for cocktails, and then out to dinner at local bar with live entertainment....what a great evening of music and conversation! This morning Larry picked us up again and took us to breakfast in town at Goodie Shop....a great local breakfast/lunch eatery. Wonderful biscuits and gravy! Thank you again Larry and Vanessa for your hospitality! After breakfast we again rolled the wheels east on Michigan 12 to Michigan 52 north into Chelsea, MI to my sister's home which is about 2 miles outside of Chelsea on the north side. We chose Michigan 12 and 52 which helped us skirt the ubiquitous Interstate construction we find everywhere. 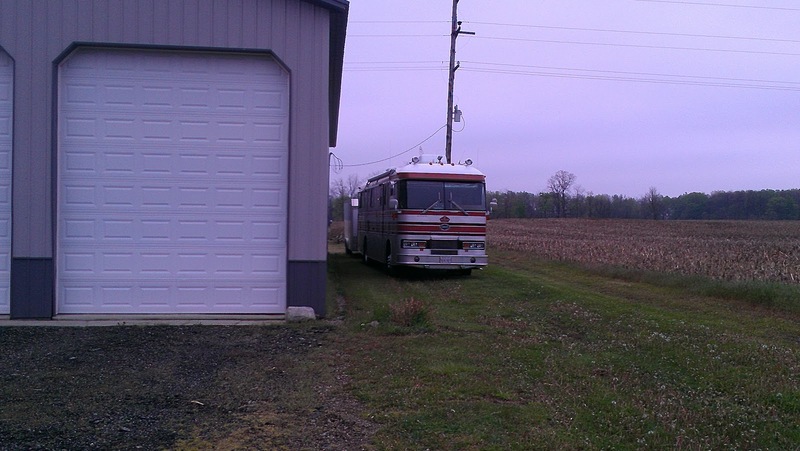 We parked the coach for a few minutes on the dirt road that runs along their property (Waterloo) and walked up to their barn to inspect the approach, and to see if there was enough room to park the coach and trailer in front of the barn. It looked to me like it would fit, and a few minutes later after driving the coach and trailer up the hill I confirmed I was right. 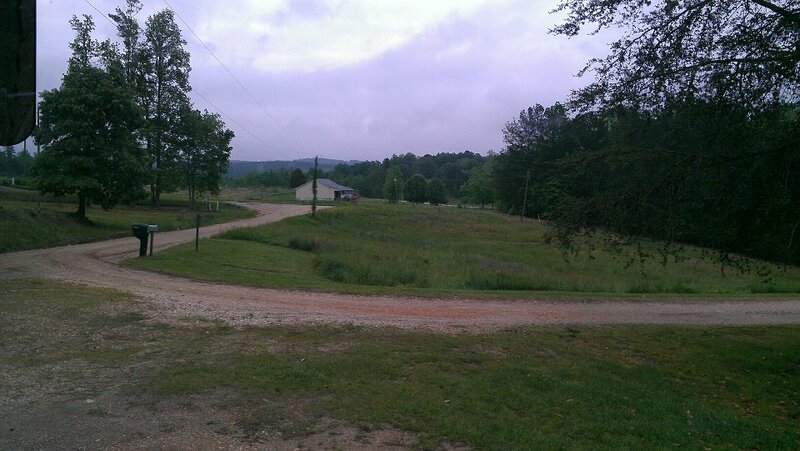 The coach is on a perfectly level spot with a nice view of Jill and Elliott's property....more country living! As we have treked northward to my sister's home in Chelsea, MI we decided why not visit Campbellsville, KY where we will spend two months later this year working at the Amazon Fulfillment center. So, we did! We are both very glad we took time to deviate off I-65 and take a tour of the facility, and inspect the campground where we will spend two months. The tour of the one million square foot facility was amazing. We got to go through the areas where we will spend our time. One job we may do is "stowing", which is what it implies.....you put items received in bins where they will later be retrieved to fill orders. The other is "picking" where you go to those bins to "pick" the items to be shipped out to "fulfill" online orders. Automation dominates this facility. Virtually everyone working there uses a handheld Motorola scanner. Every item is tracked using these scanners. At least now when we arrive as "newbies" in October we will have a general idea of what to expect. After our tour we spent part of the afternoon driving around to each of the campgrounds that provide Amazon worker campers with a place to park their RV for the time they are here. 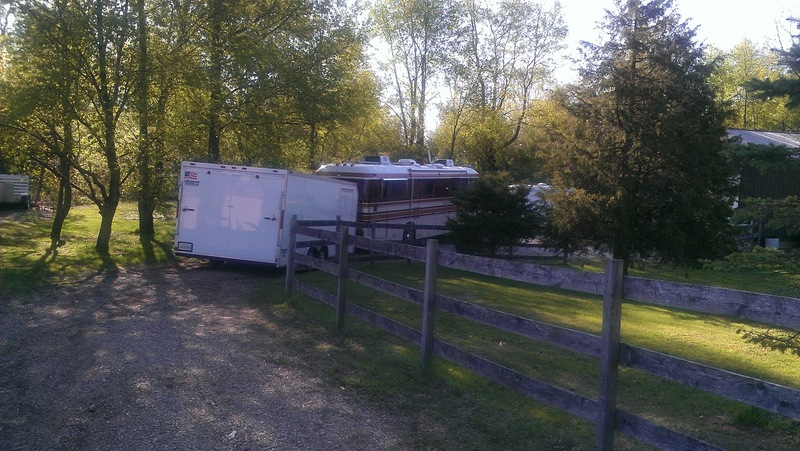 Amazon pays the RV park fee, which covers the site, and utilities. The camper is responsible for their own propane usage. We first went to the park where we got our reservation a couple of months ago. We are glad we did, because we were not at all happy with the layout and location. After touring 4 others we settled on Green River Stables which has 100' long sites where we can keep our trailer with us, and still hooked up if we wish. Plus it is near Green River Lake State Park which has hiking, biking and mountain biking trails......less than a 1/4 mile away....perfect for our off days. While we were in Campbellsville we visited two local Mexican restaurants. The first night, Sunday, we visisted Garcia's, which came "highly" recommended both by reviews on Yahoo, and word of mouth. We could not have been more disappointed in the food and service. To make things worse, and this was not Garcia's fault.....local "blue" laws prohibit the sale of alcholol on Sunday....what is a Mexican dinner without Dos Equis Amber? At any rate the food was way underseasoned, and quite bland, and there were NO condiments on the table to improve the taste. The service was lackluster, and the final indignity was they temporarily lost my debit card when I paid my bill....it was found after 5 minutes lying on the floor. Last night, Molnday, we went to Fiesta Mexico, which was the complete opposite of Garcia's. Great service, nicely seasoned food, a caddy of the various condiments you would expect in a Mexican restaurant, and beer! The chips and salsa were great! We will return! Today, Tuesday, we are off again northward bound. We'll probably get as far as Indianapolis today, where we will top off our diesel tank.....we won't see diesel prices in this range (3.70's) for a while. The night next to the Cracker Barrel in Manchester, TN was what we like....uneventful! BUT, vey, very cold....for the first time in several months we had to turn on the block heater to start the Detroit Diesel. This was after I had turned on both electric heaters, and the gas furnace that heats the bathroom to warm up the coach from 58 degrees! We're not in Florida anymore, obviously. Originally we had decided to take two days from Manchester to reach Campbellsville, KY, but the forecast was for wind Monday, and it is no fun driving a rig with a high profile in wind....we not only have a high profile, but a LONG profile. So, we decided to pound out the 211 miles to Campbellsville in one day. The weather was spectacular, to go along with the scenery. 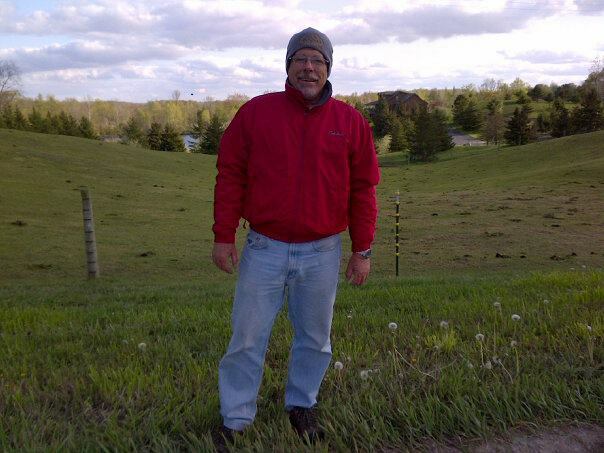 As we hit the Kentucky border the landscape began to open up a little revealing large pastures, and nice vistas. I like to stop about every 60 miles, or so, but, amazingly, there were no rest areas. 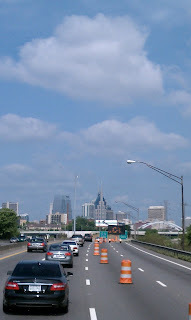 Then we hit Nashville where the exit to I-65 northbound was closed.....ugh....I hate driving in traffic the long way around any metropolitan city, but we had no choice but to add a few miles to our drive this day. 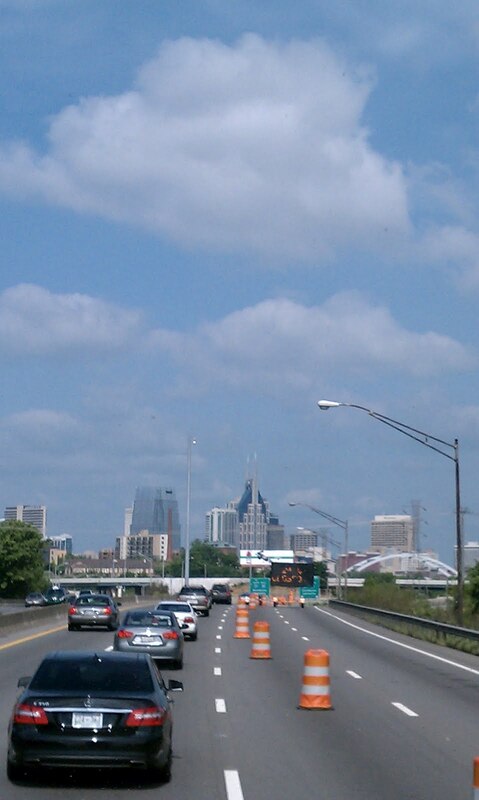 When we are back in the area in the Fall we will take a long weekend to come down and properly visit Nashville. We hit the Louie B. Nunn Parkway north of Bowling Green, KY and headed directly east. 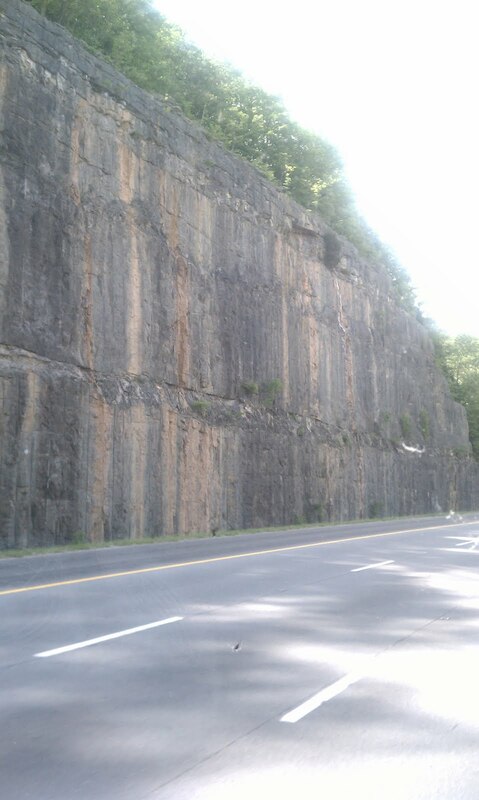 What a beautiful parkway this is.....as good, or better than the Interstate, for sure! We finally came up on SR55 and headed north to Campbellsville, but not before stopping at the local Tractor Supply store to park, and take a lunch break. 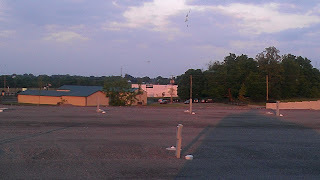 I'm always looking for large parking lots that I can pull into when I need a break, and no rest areas are in sight. This one really fit the bill. We arrived in Campbellsville around, what we thought was 2pm, but we both forgot that we had re-entered the Eastern Time Zone, and, therefore, lost back that hour we gained in Alabama. We have found that Campbellsville is also a college town, home to Campbellsville University, and on top of that they have several of the box stores......Lowe's, Walmart, Tractor Supply, Kroger, and a number of national fast food chains. What they don't have is a good Mexican Restaurant....that is not to say they don't have Mexican Restaurants. We went to dinner at Garcia's, which had the highest rating of the three in town (on Yahoo), but were very disappointed in everything except the chips and salsa, which were very good. Usually if the chips and salsa are good the food is good, but this restaurant works hard to disprove that thesis. Not only that, but due to local liquor laws they are not able to serve alcohol on Sundays.....what is Mexican food without Dos Equis draft? The final blow came when I gave the hostess our debit card to pay for the meal and she returned to my table without it.....hmmm? We looked on the floor around the register, under tables, and she finally found it on the floor in the kitchen....we will not be returning there! Well, we parked in the Walmart to unload the T-Bird so we could drive around the town a little and find the Amazon Fulfillment Center, and an RV Park to stay in for two days. We located Heartland RV Park right across the street from the Amazon Center, and pulled in and snagged a spot....only 5, or 6 RV's here right now. We, unfortunately, did not call them fast enough and they got booked for the Fall, but we are on the waiting list. 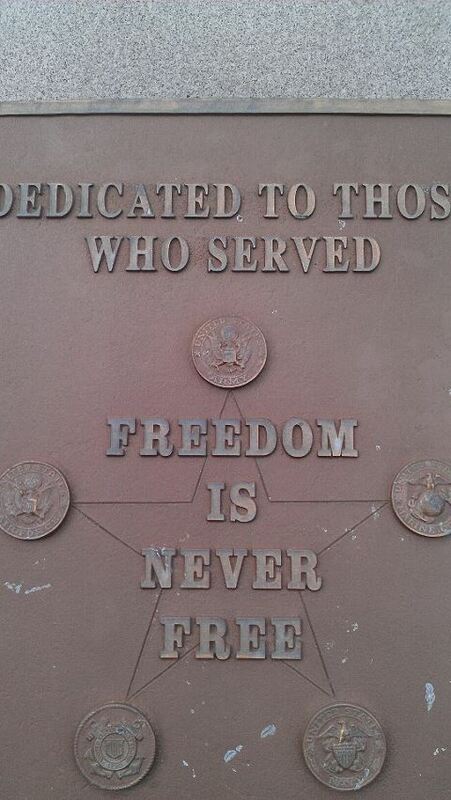 Tomorrow we will drive up to the park we do have a reservation at, Lakeway RV park, and check it out. I was looking for some out of the way place, kind of like DeFuniak Springs, FL a few weeks ago, to overnight and charge our batteries back up, and I found it in spades! 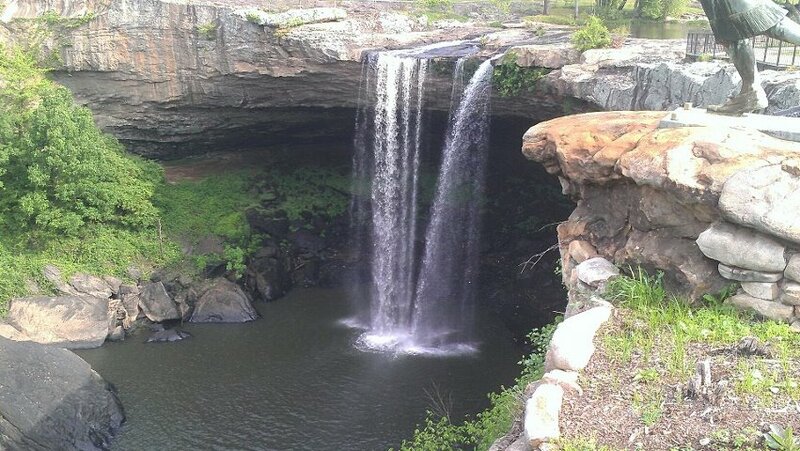 Gadsden, AL is the home of Nocculula Falls Park, and incorporated into that park is this really cool city owned campground with long pull through spots that allowed us to pull in and NOT drop the trailer.....AND, get this, our 70 foot pull through spot, which came with full hookups and cable TV, was $19 per night! Gadsden is kind of northeast of Birmingham, and the road up from Interstate 20 (431) is a cake walk.....4 lane divided highway with almost new pavement. We left Ranburne and our college friends around 10:45am to do the 80 miles up to Gadsden.....one thing I didn't mention above is that the long pull through sites are first come first served, so we needed to get there early to snag a spot. The drive was totally uneventful other than the perpetual construction work going on along the Interstate in this area between the Georgia border and Birmingham. We arrived at the Nocculula Falls (named for a Cherokee Indian princess who leaped to her death to avoid marriage to someone she didn't love) campground around 12:30pm, and were promptly processed and sent on our way to P-5 where we promptly plugged in to begin charging our depleted batteries, and then walked up to the laundry to do our overdue laundry that had been collecting for the past 9 days. They only charge $1.00 per load to wash and dry....most places charge $2.00+. After getting the laundry done we decided to take a bike ride to a state liquor store about 6.5 miles away....easier said than done. One of our complaints about the South is that there are very few actual bike lanes, paths, etc. to be found. Gadsden is no exception. After riding 2.1 miles back to HWY 431 where we had to ride another 4+ miles along a busy arterial highway Elaine said "Thanks, but no thanks! ".....I gave her the key to the coach and she returned, and I continued on.....I've been out of Scotch and Brandy for a week...a man can only take sooo much. Actually, after another 1/4 mile the 3rd lane on HWY 431 turned into a breakdown lane and the ride the rest of the way was not too bad. I arrived at ABC Beverages (state owned) in another 30 minutes after I left Elaine. I was surprised at how expensive liquor is in Alabama! A liter of Dewars White Label costs us around $29 in SoCal....in Alabama it is $49! Ouch! I opted for a quart size for $29....ouch! On the way back it began to sprinkle, but never really got serious...I arrived back at the coach around 4pm with my prizes...lol! We lazed around the rest of the day reading and watching our batteries recharge......which, by the way, was taking way too long. After about 6 hours they should have been back up in the mid 90% range, but they were barely to 87%. Hmmmm....well, maybe overnight they'll get there. We only had 140 miles to go today, we doddled around until 11am and then began getting ready to go....check out is Noon in this park. We pulled out at 11:56am and headed over to I-59 to begin our trek north into Tennessee, but not before cutting across the corner of Georgia once again. The drive was specatular.....we began seeing mountains, and valleys...at one point we got up over 2200' elevation, and were actually driving in the clouds....what a "trip" after weeks of being near sea level and seeing nothing but flat as far as the eye could see! One stop was just after I noticed my recumbent trike, which is mounted above the tool box on the front of the trailer, was wobbling terribly from side to side. I pulled over on the shoulder to see what was wrong and found that one of the two "U" bolts holding it fast to the tongue of the trailer had snapped and the other was close to snapping....another mile and that trike was toast! So thankful we have a rearview camera that let's me keep an eye on the trike! Fortunately I had two spare "U" bolts so Elaine and I installed those and were on our way again in about 30 minutes. 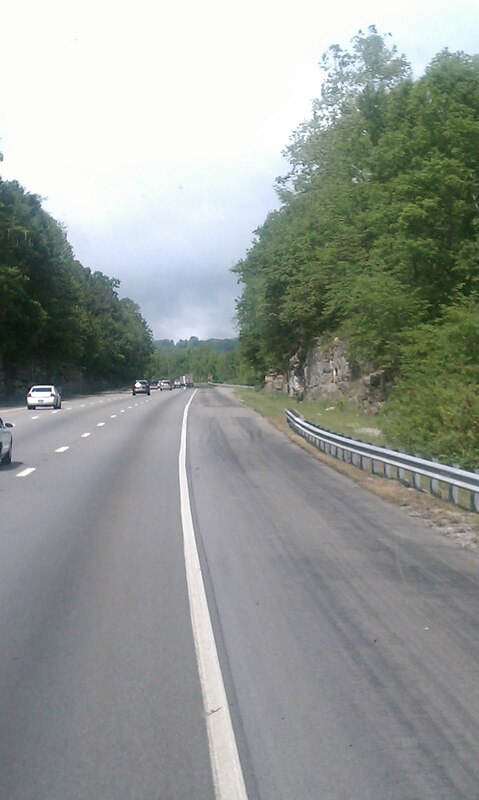 Our destination was Manchester, TN this day and we made it by 3pm after a couple of stops to eat a late lunch and just rest and enjoy the scenery a little. We first pulled into the local Walmart Supercenter. It was nice enough, but just seemed to busy with trucks, so we moved up the road 4 miles to the Cracker Barrel...what a surprise, right? It was much quieter and less crowded, so we settled in there for the night. I watched part of the Yankee/Boston game....Boston was up 9-0, and ended up losing! Then watched parts of two NBA games and decided to read, which I did until 10pm before getting tired and hitting the hay. Elaine followed shortly thereafter. The outside temperature last night got down to 43, and inside our coach.....58.....that's the coldest by far in the last 6 weeks! Had to turn on the generator to run the two electric heaters, plus the central gas heater for the bathroom....that toilet seat was COLD! Sitting here now typing and watching the puffy white clouds drift by and thinking of hitting the road within the hour. We will drive around 200 miles today up to Campbellsvile, KY to pay a visit to the Amazon Fulfillment Center where we will be employed this October. 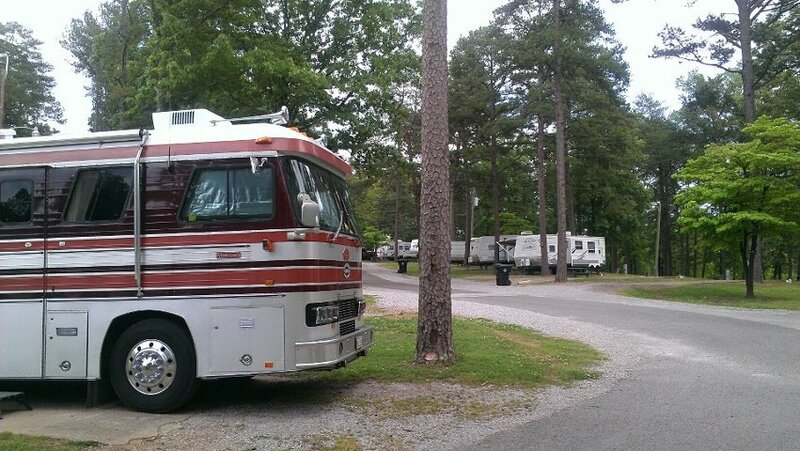 We'll check out the facility, and the RV park where we will spend 2 months. Pictures to follow! We arrived in Ranburne, AL (just a few miles east of Heflin, AL off Interstate 20) around Noon time on Wednesday to visit with old college friends from the late 60's. When we began our endless summer back on January 30th one of our goals was to visit as many friends, family, and college friends as possible as we criss cross back and forth across our great country. We did that in Stuart, and now, again, in Ranburne. Diane and Paul, our hosts (Diane being one of the college friends) found a wonderful place just a couple hundred feet from their home in the more than adequate driveway of their neighbor for us to park for two days. Our plan B was to park next to the local country store about 4 miles distant. The store would have been more than adequate, but being able to walk back and forth from Diane and Paul's comfortable country home has been a blessing these past two days. Around 10:30am Thursday morning another good friend from our college days, and also a childhood friend of Elaine's, arrived (Tom W. and Elaine grew up in the old Miami, Florida, which really no longer exists). 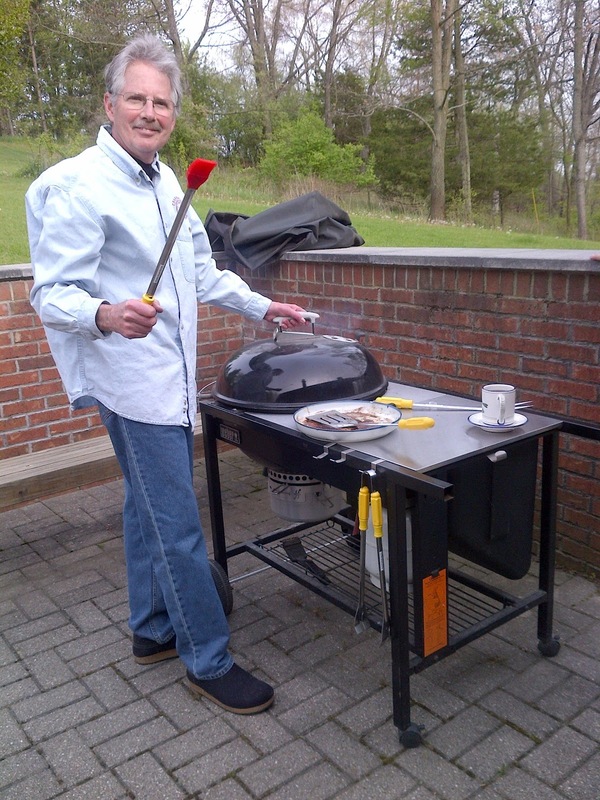 Of course, Wednesday afternoon and evening we spent hours talking with Diane about the "old" days.....Paul thank very much for your indulgence.....although I think you had almost as good a time as we did reminiscing about our young adulthood. During these free flowing discussions Diane kept us plied with food, snacks and drinks. Then we restarted all over again Thursday morning when Tom arrived from Huntsville....he had driven a little over 3 hours over to Ranburne to spend time with us, and we were both very grateful for the 5 hours he spent with us before returning home. We had tried to hook up with him in Gulf Shores, AL, and at his country home in Lacey Springs, AL, but our timing with each other was just out of sync. During our time with Tom, Diane again kept us supplied with food and drink....first some taco chips with a very interesting spicey dip, and then sliders.....this woman can cook! Later Thursday evening Diane treated us to a Mexican themed dinner with Margaritas, Chile Relleno, chicken, re-fried beans, and rice. We talked again that evening until after 11pm. As I have written before, you don't really know anyone until you get below the surface, and did we ever do that the last two days. Today, Friday morning early, I sit here writing about our time with our friends with a big satisfied smile on my face, and a still full stomach. Parting is always such sweet sorrow, and later today we will again say "Goodbye" to friends and change our view once again. It is always amazing to me how when we reconnect with old friends, and in this case friends going back to our teen years, that we can pick up our conversation as if just a short time had passed. In Diane's case it had been close to 40 years since I had seen her, and even longer with Tom. When we meet up with old friends I wonder if we will run out of things to talk about, and the answer is always a resounding "NO!". Of course we have all raised families, and had several decades of intervening experiences, but the connection is still there, the shared history is still there. From here we will begin moving our home on wheels north through Tennessee, Kentucky, Indiana and into Michigan over the next 10 days. 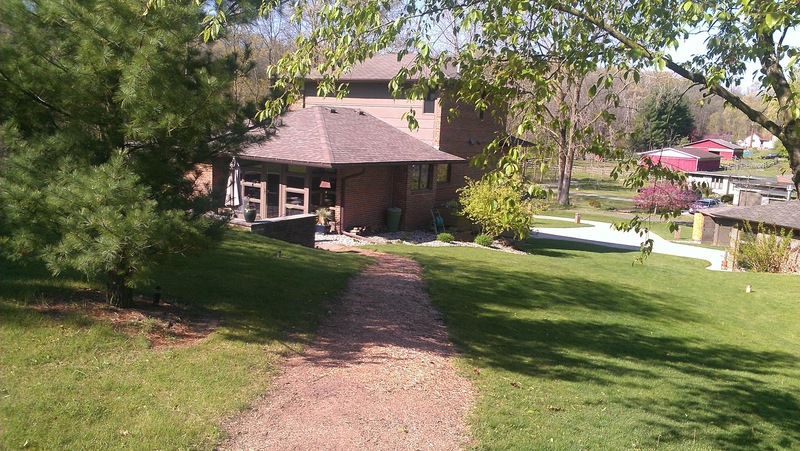 My sister, Jill, lives a few miles west of Ann Arbor and we will be spending a week, or so at her country home and catching up with her, and her husband Elliott. Jill, we'll be there before you know it so keep the home fires burning! Along our planned route is Campbellsville, KY where we will be spending 2 months come this October working at the Amazon Fulfillment center earning some extra diesel money, so we are going to check out the RV park where we have reservations (Amazon pays for that in full), and meeting the guy who graciously hired us two old folks! After the sensory overload of historic sites in Savannah we were somewhat underwhelmed by Atlanta. 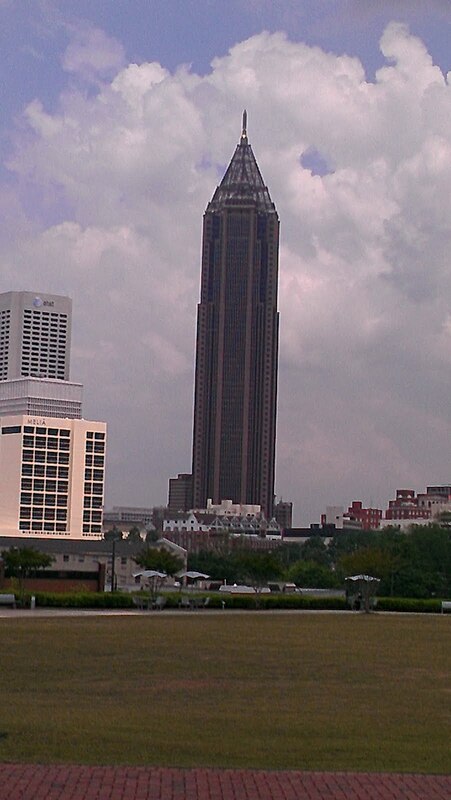 Of course Atlanta typifies much of what I have come to dislike about heavily urban cities. I'm not saying it isn't beautiful, and I'm not saying the skyline is not very interesting.....much of it is just too urban for me. 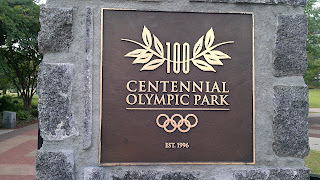 Nevertheless, we decided to move our view from the southeast side of Atlanta up to the northwest side where we would park, and unload the T-Bird and drive into Centennial Olympic Park, the home of the Summer Olympics in 1996. We arrived at the Walmart Supercenter around 11am and were immediately uncertain whether we would be allowed to stay there overnight. There were a number of signs seeming to indicate that no overnight truck, or RV parking was allowed, however, the RV part had been spray painted out.....we weren't sure if some vandals had done that, or whether it was deliberate. We found a level spot to park and were going to go into the store to find out when a security guard suddenly appeared outside the driver's window. Looking down from my high perch I couldn't tell immediately if I was going to speak to a man, or woman as the guard was in full uniform with a hat, had no makeup, and short hair. Of course, when I have a 50/50 chance of being right I am ALWAYS wrong...even as the words "good morning sir" left my mouth and were still hanging there in the air, I realized I had made a mistake, because she began to speak at the same time. So, here I am, trying to be polite, and I have already insulted the security guard by addressing her as "sir". I thought she was telling me I had to move on, and I asked "can we at least just park here for an hour? 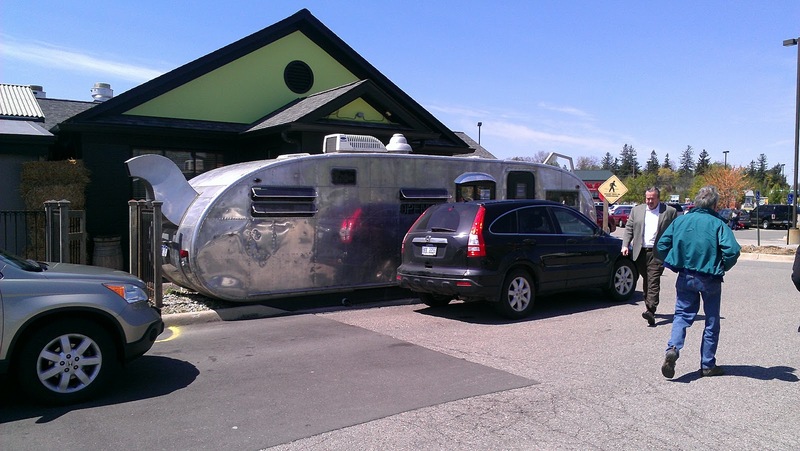 ", thinking we would have to find another parking place somewhere else. She replied, "Honey, I don't care if you are here for a week, you just can't park there! You need to go park over there" pointing to the truck ghetto on the other side of the lot...there were a lot of semis parked there. She said, "we like to keep all the RV's and trucks in that area. You're welcome to stay for as long as you please". Well, OK, that is settled....haha! So, we moved our coach over near the idling semis and reparked and releveled (by early evening all the idling semis had departed, leaving us with a quiet evening). Then we opened up the trailer and unloaded the T-Bird for the day. 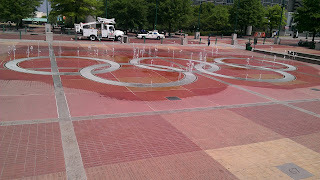 This is not something we normally like to do, but is was 15 miles one way into Centennial Olympic Park, which would be 30 miles round trip with the weather looking like rain any time. It only took us 25 minutes to get into downtown and park. As we walked into the park we could hear jazz music off in the distance. As we got closer we saw that there was a lunch time free concert in progress, so we meandered over there and sat down in the shade to listen and enjoy for about 30 minutes....what a nice start to our touristing day! Eventually we wandered off and down through the park just enjoying this large open space in the center of a large urban setting. 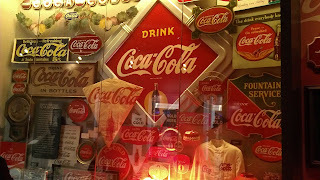 Eventually we came to the World of Coca Cola building, which is like a kind of gaudy industrial museum housing the history of Coca Cola, including the secret formula in a large, seemingly, impenetrable vault, rooms and rooms of Coca Cola memorabilia as well as animated hosts who want to tell you everyting about Coca Cola. 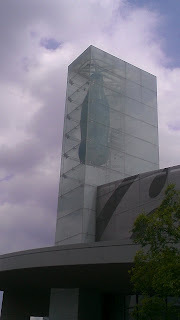 Even though it was a little over the top, and a little over priced at $14 per head (that price is with our senior discount), we enjoyed the hour we spent there, and we did learn a lot about Coca Cola we never knew. 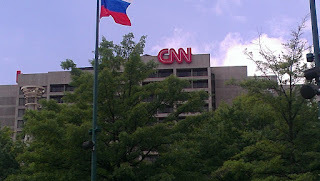 Eventually we began our walk back to the car, and I saw the CNN building off to one side of the park.....I had forgotten their headquarters was in Atlanta. 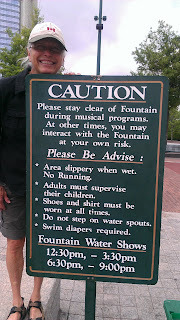 Both Elaine and I got a real kick out of the first paragraph of this sign by the Olympic Rings fountain (see picture above). 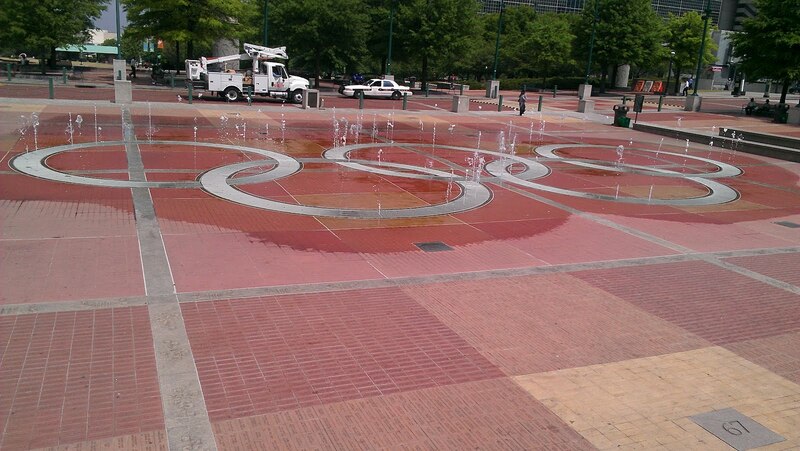 We, naturally, decided not to INTERACT with the fountain.....lol! We arrived back at the Walmart around 3:30pm and had some snacks before settling down to read for a while....around 5pm I noticed the temperature was dropping and the clouds were getting very dark. I suggested to Elaine that we should load the car back into the trailer to avoid doing it in the rain......we had barely closed up the trailer when the lightning, thunder and rain began with a vengance.....once again I'm glad I listened to that small inner voice! We were able to Skype with our daughter-in-law, Rochelle (married to our oldest son Chris) and get updated on the goings on in their family. We are hoping our grandson, Christopher, will be able to fly up in June while we are in Spokane and visit with us for a few days. It rained steadily the rest of the afternoon, and evening, and is still raining as I write this blog update at 8:30am. We'll wait until it lets up before heading furthe west to our next stop near Heflin, AL where we will spend a couple of days visiting with old friends from our college days. 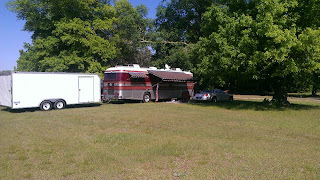 Sunday for the first time in two and a half months we pointed our coach west from whence we came.......we really enjoyed our stay at Red Gate RV Park in Savannah. This park is very big rig friendly. A lot of parks advertise that they are, but this park really is. While they only have about a dozen full hookup sites, any one of them could have accommodated our 62' length without us having to "drop" the trailer. This is a rarity east of the Mississippi, at least in our experience. Each of their 12 full hookup sites is close to 65' long, and extra wide to accommodate those big rigs with slideouts. They have an enormous dry camp area, which is where we stayed as all of the full hookup sites were booked for the weekend. All in all we enjoyed the peace and quiet of our dry camp spot, well away from the other coaches, plus were able to run our generator without disturbing the other campers. We had deployed a lot of "stuff" for the 3+ days we were there, and I was kind of dreading the "putting it away" part Sunday morning....we had put out or awning mat for the first time since we were in Bullard, TX...way back in February. 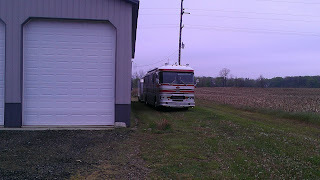 We had put our all our window awnings, plus the large patio awning, we had unloaded the T-Bird, taken out all the bikes, and put out the small Honda generator to help put juice back in house batteries when it got very overcast Saturday. Surprisingly it only took about an hour to put it all away. Around 11am we merged on to I-16 westbound for Dublin, GA.....Elaine had picked out a Cracker Barrel as our stopping point for the day....a mere 120+ miles west of Savannah. As we neared the parking lot it became obvious that we just wouldn't fit there.....a little smaller than it appeared on Google maps, and too many cars....this time I listened to the little voice in my head and didn't even try to enter....haha! Her next option was about 7 miles further into Dublin at a Wallmart Supercenter, however, when we arrived there we were greeted immediately upon entering the lot with a "NO RV, TRUCK, OR TRAILER OVERNIGHT PARKING"......OK Walmart in Dublin, we were only going to spend a $100 in your establishment....your loss. So, we sat there for about 10 minutes while the Lovely Elaine checked further up the road, and she found another Walmart Supercenter on the southeast side of Macon, just off I-475...another 50 miles......but what did we care.....it was only 1:30pm.....so we jumped back on the Interstate and headed to the next Walmart, which turned out to have one of our favorite fuel stations, Murphy Gas, on one corner of their property, plus an enormous parking lot which already contained a couple of large semis, and another motor coach. We were down to 1/4 tank so this would be the perfect stop....overnight, and then fuel up in the morning. Murphy Gas has an arrangement with Walmart that if you use a Walmart credit card you get 5 cents off the listed price (we don't have one), or a Walmart Gift card you get 3 cents off the listed price. All we do is go in and buy a $500 gift card, and then stick it in the gas pump credit card slot and pump.....no re-authorization after every $75. Whatever is left over we just use for the next tank, or in Walmart to buy groceries. With our Walmart gift card the diesel was $3.90 per gallon.....we took on 109 gallons, so we have about $70 left on the card for our next purchase. As we drifted off to sleep Sunday evening we were serenaded by some Country Western music coming from a local restaurant......very pleasant evening! I'm not a Country Western expert, but I really enjoyed the tunes of this solo male act. We were ready for a down day after several hectic days of playing tourist around Savannah, so we decided to spend the entire day there after fueling up Monday morning. I spent part of the day doing some service work on the coach.....tightening screws and bolts that tend to vibrate lose after 4,000 miles, checking tire air pressure, checking and adding oil for both the big engine and the Kohler generator, and washing the bugs off the windshield. It never fails that within an hour after cleaning the windshield a large bug commits suicide right in the middle of my windshield...never Elaine's, only mine. The rest of the day I read a good book, did some office work on my computer, and took a couple of walks. Around 6pm we said goodbye to Walmart and continued our trek west to Atlanta....well, actually Morrow, GA.....on the outskirts of Atlanta, where we overnighted at the local Cracker Barrel. This Cracker Barrel has a completely separate parking lot for RV's and trucks, and we had it all to ourselves. We'll go in this morning and buy breakfast, and then do some site seeing by car around Atlanta.....would love to bike around, but it is drizzling as I write. No pictures to post for Sunday and Monday, but I know there will be a bunch after today. 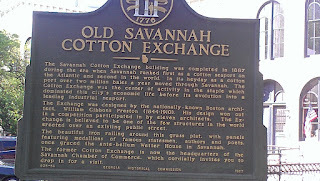 We came to Savannah with high expectations based on everything we had read, and people with whom we had talked. To say that those expectations were met in triplicate would be to understate our experience. With the lone exception of the "visitor center parking lot EVENT" we have thoroughly enjoyed driving around and walking around this genteel city. When I used to see pictures of Savannah showing the tree shrouded streets I always thought...."well, that's probably the one they preserved" in my own cynical way, BUT a street without Spanish moss covered trees overhanging both sides seems to be the exception. My only complaint is that the heavy tree canopy really interfers with satellite radio......lol.....a minor inconvenience! 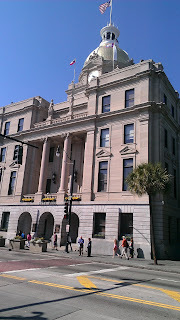 On Friday, day 2, we did some shopping and then headed down to downtown Savannah. 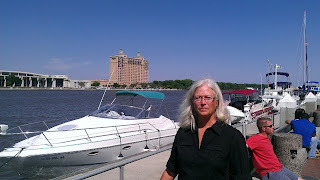 We eventually ended up on River Street, which not surprisingly, runs along the Savannah River. They have preserved the old cobble stone streets in this area, as well as the old trolley tracks. You can actually drive along this street, but it is not a smooth ride, especially in a low slung T-Bird like we have. After a couple of eye teeth rattling blocks we found a parking lot with an open space, and quickly parked. We wandered around for a couple of hours along the river, which was packed with tourists.....mostly "older" folks like ourselves who are retired. The one thing you notice quickly is that almost every structure has some historical significance with an appropriately placed plaque explaining why you should be interested. The second thing you notice is how many parks there are. Seriously.....every couple of blocks you see a park....some are placed right in the middle of the street, and you must drive around them to continue......kind of a square version of the traffic circle we see being used more today. 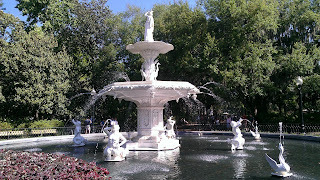 The third thing is all the large statues, obilisques and fountains.....beautifully ornate fountains! Afte a couple of hours we were getting a little thirsty and decided to try and find a local brew pub, and the first up on my Google search on my Android phone was The Distillery located right near the civic center and visitor's center. So, we headed over there for a beer and a snack before heading "home". I love dark, robust Porters and Stouts, so I chose the Lost Abbey Serpent Stout weighing in at 11% alcholol by volume, and my wife, also a fan of stout beer, chose the Founder's Porter. We chased our beer with some great onion rings. Drinking that 11% beer was like drinking 2 pints of any other stout, or porter I've had, but very, very yummy....not the kind of beer you guzzle down, but the kind you sip slowly savouring each swallow. After our bried interlude at The Distillery we headed home, and sat outside talking as the sun set on another day of our adventure eventually being chased back inside the the "no seeums" . 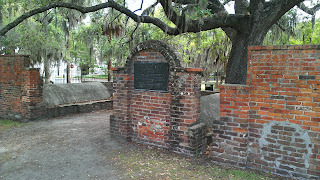 for breakfast, which was featured in the recent film, Midnight in the Garden of Good and Evil. After breakfast Katie took us on a tour of her favorite spots around town, and toured a few buildings including Montgomery Hall Digital Media Center where Katie spends a lot of time working on animation, which is her specialty......SCAD is unusual in that it has no central campus.....it occupies buildings all over Savannah......one building is the SCAD Theater which hosts art films, and and local bands. 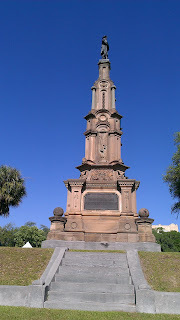 We took a walk around Forsyth Park. A very big park with a lot going on this Saturday......a farmers market at one end, a SCAD orientation for newly admitted students.....a group playing frisby football, various groups doing jazzercize, or something like that, and others just like us....walking and talking and enjoying the ambience. 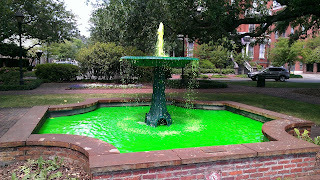 Yes, the water really is GREEN! Katie dropped us back at our car after 3 hours, and we thanked her for spending time with us old foggies, and then headed over to Colonial Park Cemetery. 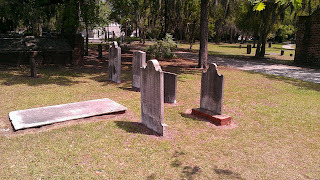 This cemetery is very close to St. John the Baptist Cathedral. 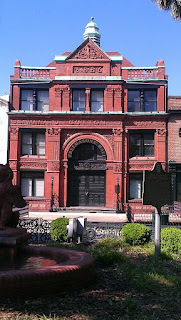 It was opened in the early 1700's, and closed aroud 1830, but is now preserved by a local preservation group. 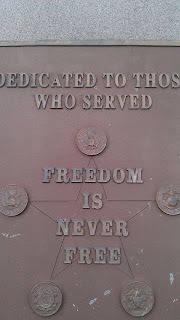 I always find it very interesting to walk through old cemeterys.....you can learn a lot about the history of a town, and of course, there were many of the historically significant plaques at various crypts and grave sites telling us about the lives of the occupants. 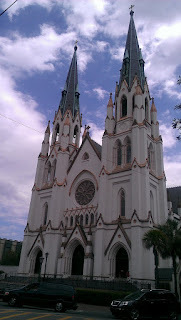 This cathedral is beautiful....I wish we could have gone in side, but there was a worship service in progress at the time we were there. We spent another hour or so on our own, and then headed back to our home for the afternoon....tomorrow is moving day, so we'll have to load the T-Bird back up and put our "stuff" away. This RV Park (Red Gate) is a wonderful, quiet park......except for the freight train that rolls through every morning around 6am.....lol. Nevertheless, we recommend this park highly! Following are a couple of videos compiled from video clips I was able to assemble together. You may have noticed the past few days that I have been changing the font size, and style. Trying to find a more easy to read style. If you like this one, leave a comment....your feedback is appreciated! The first video is comprised of clips from around Savannah, where we are now. The second is of our canoeing excursion on the Loxahatchee River almost a week ago.....amazing that it seems longer ago than that. It has been a very pleasant 3 days in the Savannah area. The next post (to be posted shortly) will be about our Friday here. Our night behind the Cracker Barrel Restaurant in Kingsland, GA was uneventful, which is what we strive for daily. No one wants to get a knock on the door at 2am from a security guard, or police saying you have to move on. We don't always succeed, but we are generally successful in our efforts. We have only been approached once by a private security fellow at the Walmart in Jacksonville. I hadn't even turned off the DD when a security guard was talking to Elaine through her window advising we could only park there for 2 hours....otherwise our stays at Walmart Supercenters have been totally uneventful. Finding a free overnight spot takes some advance research. As our journey has evolved Elaine has taken on this responsibility, and, frankly, has gotten quite good at it. When we decide we want to dry camp Elaine will check local Walmart Supercenters in the area we have chosen to spend the night. She will pull up an overview of the parking lot and street approaches on Google Maps. We need to know if we can maneuver in the lot, and if we can get into it easily from the local streets. If you have been following our blog you know that we have spent a lot of time overnighting in Walmarts since we crossed the Mississippi. Walmart Supercenters are generally open 24/7, have good lighting, and usually some security at night. Most Walmarts allow overnight RV parking, but it never hurts to go inside and ask the store manager's permission. We usually shop before approaching the store manager, so when we talk to him/her they can see we have spent money in their store. No one has refused us until the Jacksonville Walmart. Our second favorite dry camp spot is behind Cracker Barrel Restaurants, and we have done this frequently, too, starting in Midland, TX. They are always located in nice neighborhoods, and not that far off the Interstate. We have never been refused at any Cracker Barrel, and we usually get breakfast in the morning before we depart. Third on our list are Home Depots, but so far we haven't had to take the third option. A fourth option is to dry camp at RV Parks....normally a site with full hookups will cost anywhere from $15-$45, but if you ask for a dry camping spot, the price goes down to $5-$25, and you still have access to the dump station, club house, showers, workout rooms, etc. 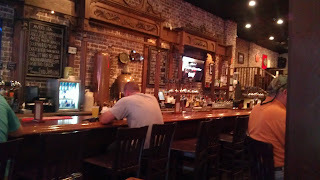 We investigated several Walmart, Cracker Barrel, Home Depot options for Savannah, but they were either too far from downtown, or the parking lots were too small, or we didn't like the "vibe" of the parking lot when we got there. The "vibe" thing came into play yesterday at the Home Depot, which was not far from downtown, but we just didn't comfortable with the parking lot "vibe". In addition, we are staying here 3 days, and since we don't stay in one dry camp spot for more than one night we would have to keep moving every day, so we chose the 4th option, and are staying at Red Gate RV Park in their dry camp spots for $25 per night. As you can see from the picture below, this is a nice spot for $25 per night. Now back to the "uneventful" thing we strive for daily.....Elaine had chosen the parking lot at the Visitors Center in Savannah for us to park during the day yesterday, before moving on to the Home Depot (which we later rejected). I exited I-16 at Montgomery (essentially the eastern terminus of this Interstate), and then turned left on to MLK Blvd. As I approached the entrance to the lot I said outloud "Elaine, what have you gotten us into? I don't know if I can make the left turn into this lot!" It appeared from the street to be VERY full, and difficult to maneuver in, but, and this is the key point....I ignored that inner voice, and turned into the lot......my trailer cleared the center divider curb by 1 inch.....as I drove into the lot I began to realize there was no way I could make the left turn into the RV section of the lot......trees hanging over the entrance, and a narrow entrance made it impossible. I saw a section of regular parking spots with about 9 spaces in a row empty, so I pulled my 62' into that spot to get out of the way of tour buses, and cars that were backing up rapidly behind me. I thought, "as long as no pulls in the spot directly behind the trailer I can get out again". Elaine walked over the parking kiosk and asked if there was anywhere else in their lot we could fit, and she said "NO", because this was a busy day with lots of school buses coming to the nearby museum. She said we could stay in the hastily chosen spot for 30 minutes while we figured out where we would go next. While we were doing that, some knucklhead pulled into the spot directly behind the trailer. By the time I realized it, the knucklhead was gone. Thank God we have walkie talkies, because I don't know how we would have gotten out otherwise. It took me about 10 minutes of maneuvering our behemoth back and forth almost hitting the knucklehead's car several times, as well as a tree, and a sign, but SOMEHOW, by the grace of God we finally exited the temporary spot to the applause of passing tour bus occupants......lol! THAT is what we try to avoid, but sometimes, in spite of our best combined efforts we have an EVENT. It probably took me about an hour to get rid of the jitters after that claustrophobic experience.....we drove over to the local Home Depot lot, and sat there for about an hour.....we didn't like the "vibe" of the area, or lot, so, using RVParkReviews.com we found Red Gate RV Park, and snagged a dry camp site for 3 days. After dumping our gray and black tanks we got set up in our spot, deployed the awnings, awning mat, and recliners and spent the afternoon reading, and listening to music. Around 6:30pm I got out the BBQ and we grilled some filets, cracked open a bottle of old vine Zin, and watched the sun set.....what a great end to a somewhat eventful day! Have we been here 10 days already?